Jonny Gould's Soccermongery: If Togo wanted to play, their government shouldn't have stopped them. If Togo wanted to play, their government shouldn't have stopped them. Togo's players have returned home after the deadly rebel gun attack on their bus. Final bids by Africa Cup of Nations organizers to convince them to stay fell on deaf ears. 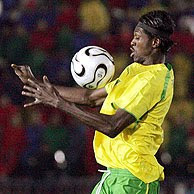 But Togo's squad wanted to stay on to honour those killed in the attack as their government prepared to withdraw them. They left their camp in Cabinda, Angola late Sunday night. But Confederation of African Football spokesman Kodzo Samlan told the Associated Press he spoke to the players and "they confirmed they want to play". He said "the players understood that they had to play to honour the dead". Three people were killed and eight injured in the ambush on Friday. Football should have won this decision. 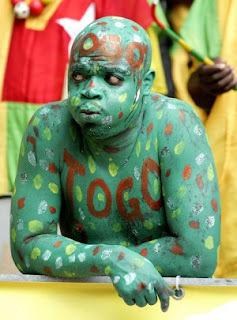 If Togo's players and tournament organisers wanted them to stay, then stay they should have. On a very bad day for sport, it was politics and terrorism which prevailed. Sport's being eroded by the threat of terror slowly but surely. We've already seen the Indian Premier League moved to South Africa and a threat from England to withdraw from the Comonwealth Games in the autumn due to security fears. Football should have stood firm. Now every major sports event will be compromised by issues of security and mere threats of terrorism. This decision was bigger than football, bigger than sport. Now a cloud hangs over every international sports event into the forseeable future. I think it’s important to remember that terrorism blighting major sporting events is nothing new. The one event that immediately springs to mind is the murder of Israeli athletes in the Munich Olympics in 1972. There have been others as well. However terrible these atrocities are, it’s vital that major sporting events are staged all over the world, with the widest possible range of countries taking part. Of course, we should take advice from security experts and expect some inconvenience when travelling, but withdrawing from or cancelling major events should only be used as a very last resort. If we allow our lives to be dictated by terrorists, they have won, regardless of whether any attacks actually happen.